The Let’s Share the Sun Foundation was formed as a 501c3 in 2010 by two 1985 Notre Dame Graduates: Nancy Brennan-Jordan and William Jordan. There is limited access to electricity in poor communities throughout the world. Energy experts estimate 1.7 billion people live without electricity, while fossil fuels continue to diminish. Getting power to isolated areas used to be impossible. Off grid solar energy has significantly decreased in cost and can now deliver electricity to these isolated areas. 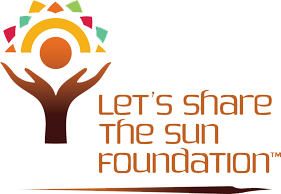 Let’s Share the Sun Foundation facilitates the use of solar energy in poor communities throughout the world to enhance the quality of life of those communities. The Foundation helps install solar power in some of the poorest parts of the world; places that are rich in access to the sun but lack basic resources. With technological innovation, solar panels are more efficient, smaller and less expensive today. Now, solar power can be installed anywhere at a reasonable cost, in ways that create local jobs in poor communities. Solar power can bring electricity to hospitals, schools, clinics, and homes to improve the lives of the poor by utilizing the free and abundant power of the sun. Solar technology has been around for 50 years, but is rapidly improving and reducing in cost. The Foundation has partnered with local solar installers, panel manufacturers, and US solar developers to bring solutions to communities.